Coming Soon – Join us for the second Vegan Pop Up in Toronto and meet some of the people behind the amazing vegan businesses we have in the GTA. 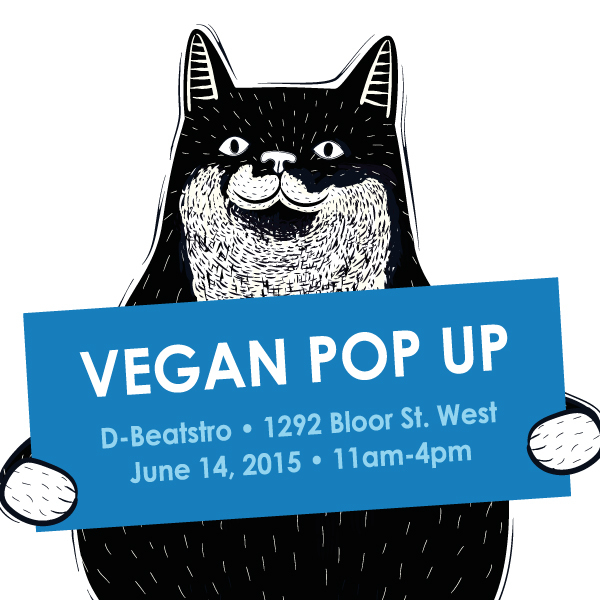 We have invited local Toronto vendors that primarily & enthusiastically make vegan products – like baked goods, meals, snacks, body care items, & other items to showcase their goods & services at the Vegan Pop Up. List of participating vendors will be posted shortly. Come out and meet folks that make things you love already or get introduced to something totally new. Admission is free – we will have a raffle to raise money for ARK II – Animal Rights Kollective and the Burrito Project Toronto. We will also be collecting vegan food donations, and companion animal food/toy/treat donations for charity at the door if you wanted to drop some off while you’re visiting all of our awesome vendors. Accessibility: D-Beatstro is a main floor venue with a small front ramp. It is physically accessible and also has gender neutral washrooms.